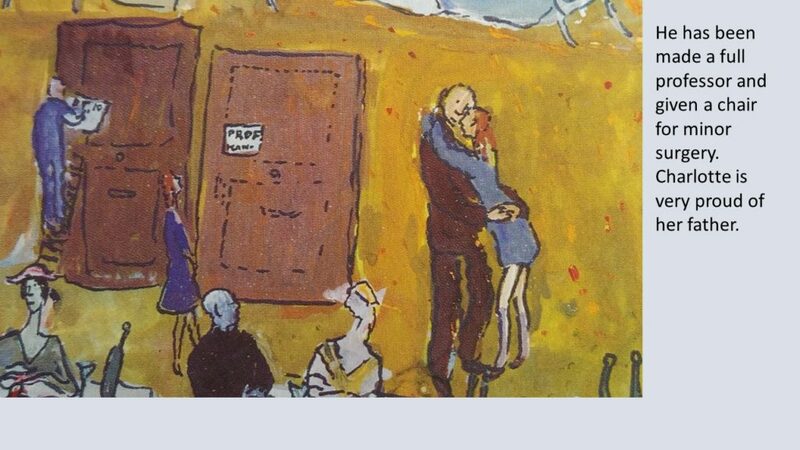 The Jewish Historical Museum in Amsterdam has opened one of the most remarkable exhibitions you are ever likely to see, Charlotte Salomon. Life? or Theatre? It runs for a generous five months from 20 October 2017 to 25 March 2018. The occasion is the 100th anniversary of the artist’s birth in 1917. In 1943 she was murdered in Auschwitz. Life? or Theatre? is one of a kind. 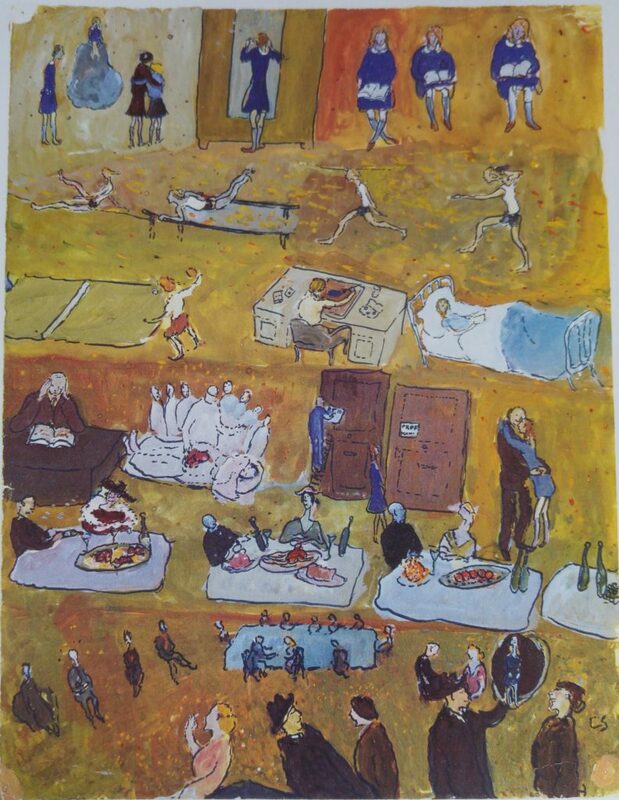 It depicts in paint, tells in text, records in dialogue, and accompanies in song the (barely) fictionalized life story of the Berlin Jewish artist who made it, in the south of France, between 1940 and 1942. It is peopled by characters drawn from her life, with different – sometimes only slightly different – names but unmistakably and often humorously recognizable faces, personalities and histories. 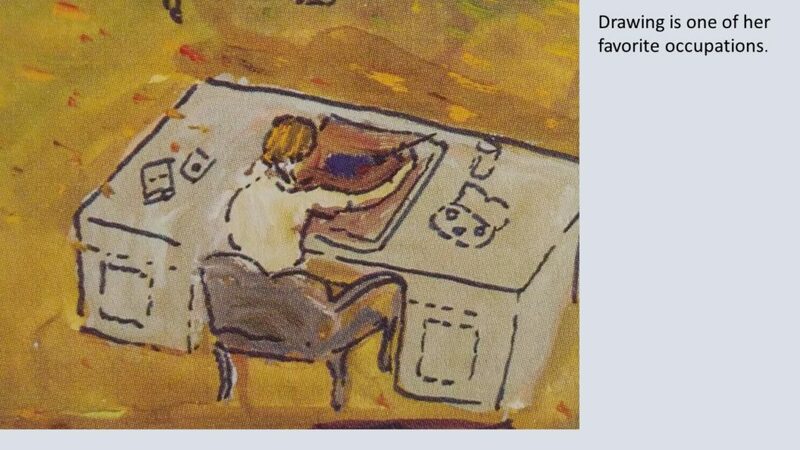 Allow me to show you one of the 769 gouaches and one of the 211 overlay sheets that make up Life? or Theatre? 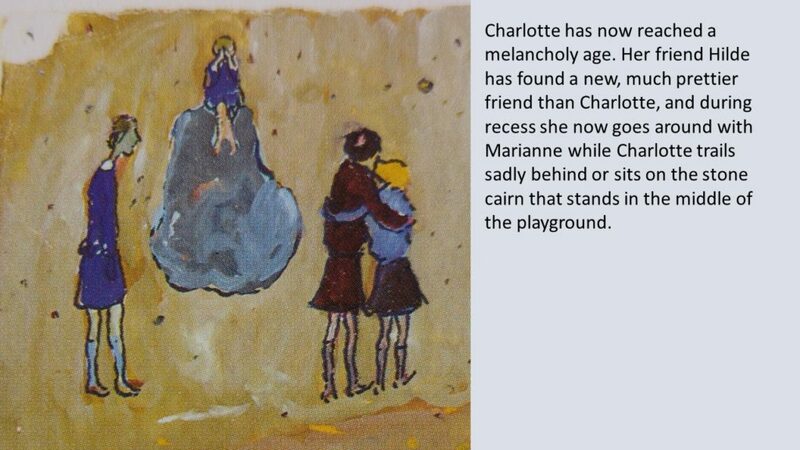 When she was nine years old, Charlotte Salomon’s mother died. Her father was an ambitious surgeon with no time for child-rearing. He put his daughter into the care of a succession of governesses. When she was thirteen, her father remarried. 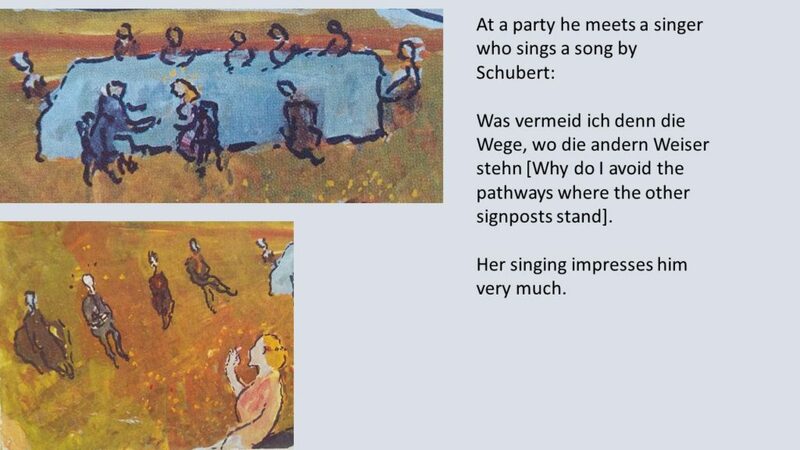 Here is how, ten years later, as a trained academic artist, Salomon told about, depicted and sang this decisive transition in her life. This is the entire gouache on which Salomon painted the details above. The sixteen details are not divided by lines or frames. They do, however, have different backgrounds, distinguished by color and/or dots or stipples. The text is written and painted on a separate sheet of tracing paper of the same size as the gouache. Illustrated left on its own, right as an overlay. It seems to me that the process of creation must have begun with a text recounting the sixteen moments painted in the details, which look like illustrations of the incidents described. But the written text on the tracing paper, which takes account of the contours of the composition, must have followed the painting. So there seems to be a missing element – a text, perhaps a notebook, in which Salomon wrote out her story before starting to paint it. The gouache and overlay above are typical of the “Prelude” of Life? 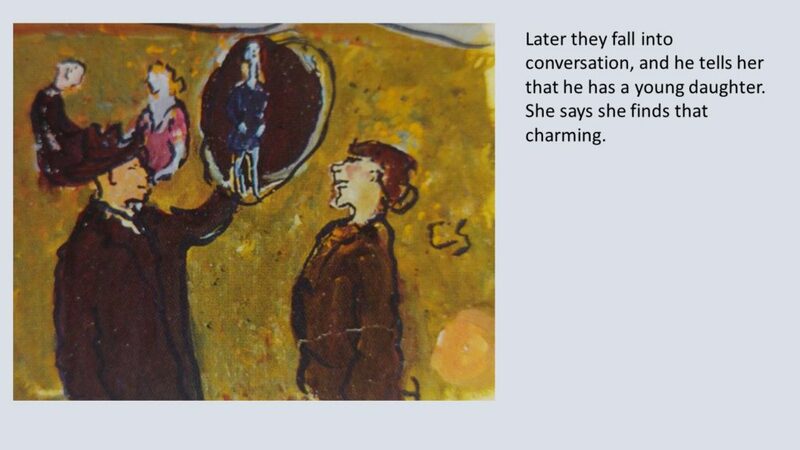 or Theatre?, the section dealing with the heroine’s early life, when every day was an eternity. The closer she gets to the present, the quicker the pace and the more abbreviated the forms. In this sheet from the “Epilogue,” Charlotte is standing beside the body of her grandmother, who has just jumped out of a window to her death. This takes place in the south of France, where the grandparents and granddaughter have sought safety from the Nazis. The words “I hope you’ll never forget that I believe in you” were spoken to Charlotte in Berlin, before her departure, by the lover before whom she kneels in a previous image. More than a lover, Amadeus Daberlohn (Alfred Wolfsohn [1896-1962]), who came into her life as a (Jewish) voice coach for her (Jewish) stepmother, when Jews were only allowed to work for each other, was an inspiration of cosmic proportion, the motivator behind her decision, after her grandmother’s suicide, to turn her life into a work of art. I will say no more about the content or complexity of Life? or Theatre? I urge you to read it, either in the book edition I brought out in 1981, on the website, or best of all at the exhibition. When I first went through Life? or Theatre? in 1978 I was overwhelmed and have remained so. 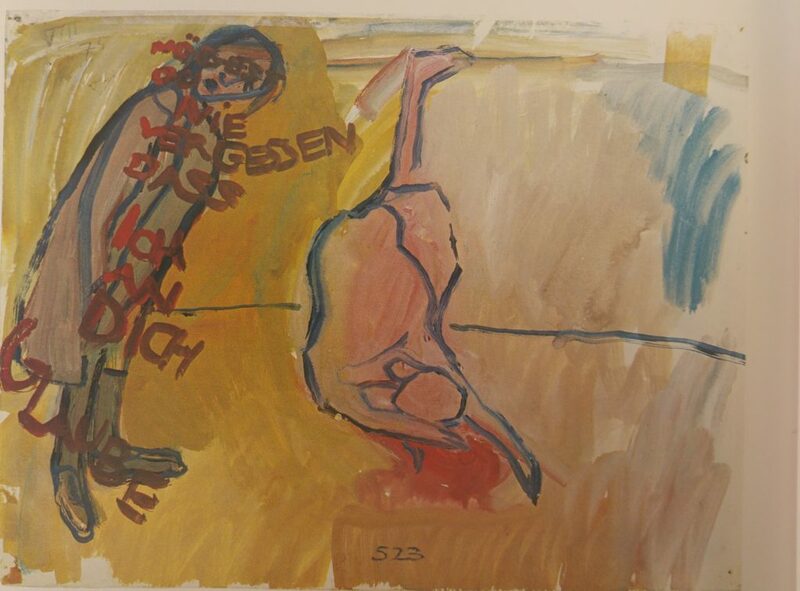 The experience is now intensified by the exhibition at the Jewish Historical Museum, curated by Mirjam Knotter, which presents all 769 numbered gouaches of the work, in sequence and with transcriptions of the texts, supplemented by a disturbing painted letter. Explanatory and supplementary material includes wall texts, interactive screens, music in headsets, videos, household objects that belonged to Charlotte and several works preceding Life? or Theater? Even more complete is the website offered by the museum. It presents the entire work, with the tracing sheets that you can slide with variable opacity across the gouaches they accompany; the painted reverses of the gouaches, some of which are numbered and belong to the main work; and 193 unnumbered gouaches related to Life? or Theatre?, as well as the painted letter. The texts can be read in one of four languages. You can listen to a reading of the English translation in a pleasant British woman’s voice and to the music cited. Life? or Theatre? is full of ambiguities and traps that force one into false responses. There is more than one example in the page illustrated. Three of the four lines of the text written forcefully in red are from a famous poem by Heinrich Heine, “Die Loreley,” which was often set to music. But the second line is different. 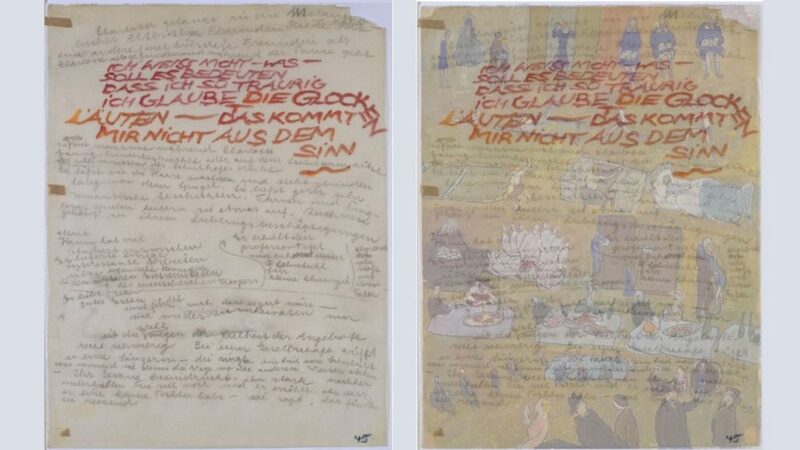 Where Heine spoke of being saddened by “ein Märchen aus uralten Zeiten” (a fairytale from the depths of time), Charlotte writes “Ich glaube die Glocken läuten” (I think the bells are ringing). There is an intriguing possible reason for this. Charlotte’s stepmother to be was Paula Lindberg (1897-2000). In Life? or Theatre? Charlotte gives her the name Paulinka Bimbam. In German the word bimbam means glockenläuten – bell-ringing. Inserting bell-ringing into Heine’s mournful poem marks Paula’s entry into Charlotte’s life with a tinge of unshakeable sadness. (With thanks to Loekie Schwartz for this find.). She also leaves out the last word of the first line – “bin” – which is always supplied in transcriptions of this sheet, with no explanation given. Far more extreme is her play with the title of her creation. 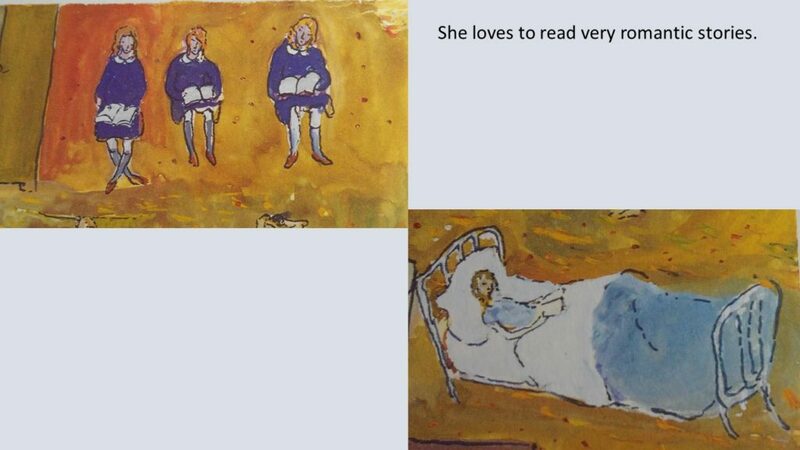 On the first page Charlotte Salomon paints the title of the work, and gives us her first surprise. It reads Life? or Theatre? but the letters can also be read as Teleater where the prefix “tele” implies Charlotte’s need to see things from a distance. Knowing this, Belinfante’s initial interpretation of the word requires reversal. An opera glass functions not to keep things at a distance but to bring them closer by. This certainly is more fitting, I believe, for what Salomon does in Life? or Theater? 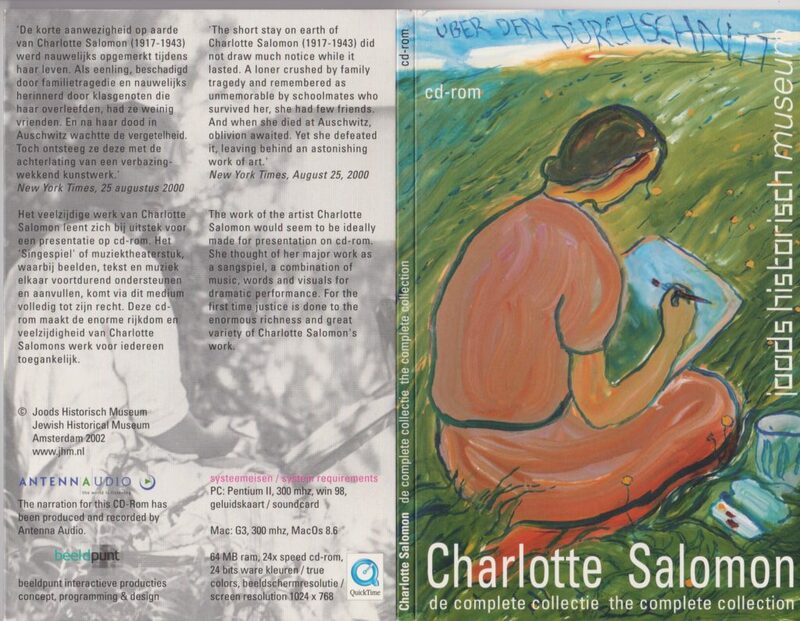 In the meanwhile, then, Charlotte Salomon’s masterpiece has come to be known by a title she never gave it, with a double question she never posed. It gives a somewhat conventional title to a work she called “wildly eccentric.” Who will be brave enough to follow her and retitle her creation Life? or Teleater? © 2017 Gary Schwartz. Published on the Schwartzlist on 30 October 2017. 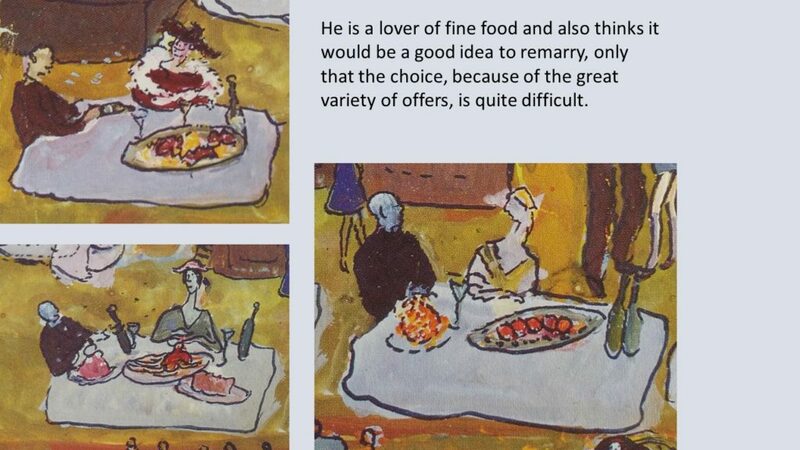 Texts translated from the German by the late Leila Vennewitz (1912-2007), first published in Charlotte Salomon, Life or Theater? An autobiographical play with music, Maarssen (Gary Schwartz) 1981, with preface by Judith Belinfante, introduction by Judith Herzberg and editorial note by Gary Schwartz. Photography of the gouaches by Frits Terpoorten, here photographed from the printed pages. The text sheet on tracing paper from the website charlotte.jck.nl. 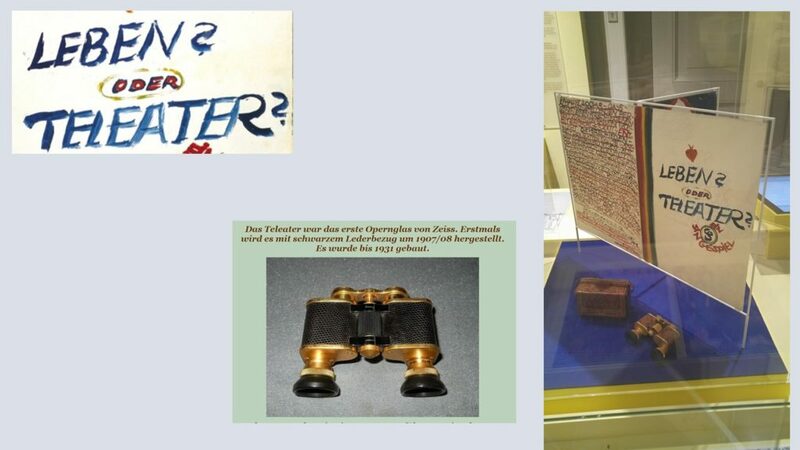 Correction, 30 October: It was not Judith Belinfante who found the link to the Zeiss Teleater but Mirjam Knotter, during her research for the exhibition. It was she who tipped Judith Belinfante when a Teleater showed up on eBay; Judith paid for the purchase. Mirjam mailed this information in response to the column and added that she sought a way to conjoin “Theater” and “Teleater” in a graphic rendition of the title, but decided – who can say she was wrong? not I – that this was too complex to handle. Amplification, 2 November: Katja Reichenfeld reminded me that in 2002 the Jewish Historical Museum brought out a cd-rom with all the content now shown in the Dutch and English sections of the website at http://charlotte.jck.nl. The navigation in a cd-rom lacks the improved functionality of a present-dat website, but the editorial work was all done by 2002. There is so much to say below the line that I cannot even begin. A deeply touching work of art and life. No doubt about it. If I may make a few tentative remarks: the reading “Teleater” does not really make sense, or only with a long stretch of the imagination (the opera glass notwithstanding). It would be a very elaborate play on words indeed and at a highly sensitive spot: are there any examples of this kind of word play in her writings? Looking at the inscription, it seems to be a slip of the brush, as these things can happen when one works in a medium that does not permit corrections. All the more so as she made no effort to lengthen the foot of the apparent L (compare with the L of “Leben”). However, the middle line of the E was lengthened so as to touch the second ascender of the H. Her mistake was in making an E instead of an H. The spelling “teater” exists in Yiddish. Even if the “TELEATER” reading were correct, it is obvious that there is a slip of the brush in the writing of this word: i.e. the over-long middle stroke of the first (apparent) E. Yet already on the low-resolution web image of the word, I can see that a second stroke was added to it, extending it to form an H: this is exactly where one would expect a correction if she meant to write THEATER (this can easily be checked on the original). Another slip of the brush would be the unusually short bottom stroke of this first “E.” The joined ER at the end was due either to lack of space, or would prove that the artist was not really “bei der Sache” on that day. 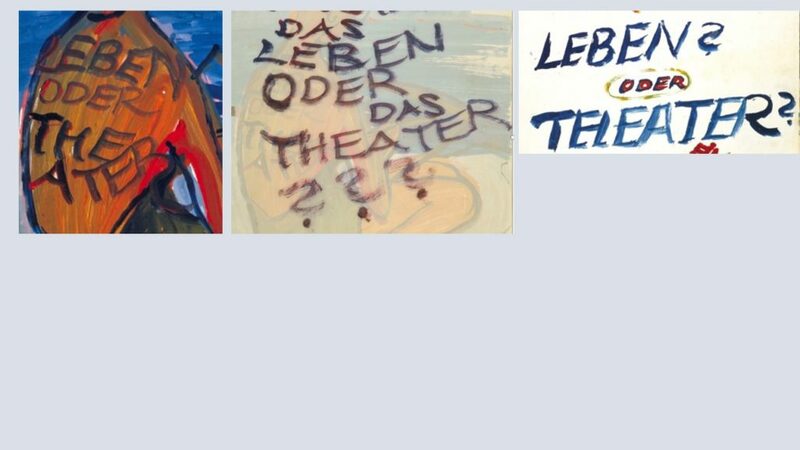 The only thing left to explain would be the apparent “serif” of what I read as an H and you as an L. Such “serifs” can be seen on the H in the first of your trio of “LEBEN ODER THEATER” images, but it could also be due to the confusion that can arise when making mistakes. It also looks like she might have changed brushes after writing “LEBEN,” the letters of which look quite shaky. I can imagine that there is a lot riding on the “TELEATER” reading, but the question remains whether it would be in character at all, since it imputes a weird, solipsistic kind of humor to the artist that would accordingly undermine her basic, oft-repeated question. I must correct the above. Using a higher-resolution image (available at http://charlotte.jck.nl/ ) and using magnification, it seems that the middle stroke of the initial E/H was done at one go. Therefore it is not a correction, as I claimed. The strange aspect of the word LEBEN is probably due to the fact that the brush was still relatively dry, and it remains to be seen how often she re-inked it, or in what order she made the individual strokes (this can be seen to some extent by inverting the image at high magnification). Regardless whether the correct reading is THEATER or TELEATER, the fact remains that she made a mistake: which mistake would be the most likely? 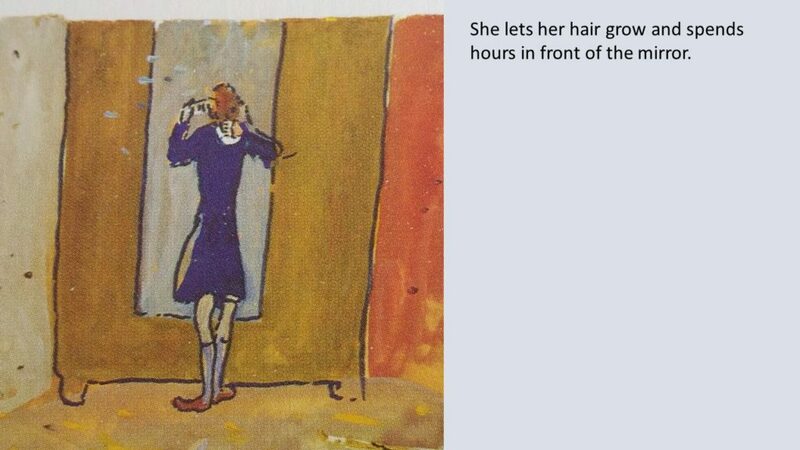 The TELEATER reading seems to have a long and prestigious pedigree, but I challenge the scholars who defend this hypothesis to find a single (other) occurrence of this word in Charlotte Salomon’s work, or even a representation of an opera glass. The hundreds of pages of her “Singespiel” that I have read so far tell me that Salomon created a highly complex work that deserves a corresponding approach. The word TELEATER and the idea it is supposed to express do not add anything to what could be adequately expressed by the word THEATER, assuming Salomon’s idea of it was limited to “looking at life from a distance” (which the word’s connotations in German does not imply). The playfulness that she works with is on a much more serious and elaborate level than that of mere playing with words for effect. And her idea of the relationship of art and life does not seem to be one of distance, but of close intertwining inseparable from love. The question “LEBEN oder THEATER” seems to be rhetorical and does not imply duality, but complementarity. The arguments for reading TELEATER are too thin to warrant Salomon’s remarkable work being used as publicity for a German industrial product. This is no light matter: please reconsider. These are interesting remarks, but to my mind they reverse the order of evidence by 180 degrees. The word written on the title page, as I see it, is plainly and incontrovertibly TELEATER, even if the lower bar of the L is on the short side. What Jean-Marie Clarke is then saying, as I see it, implies that if this reading does not make sense to us, then it must be wrong. I would take the opposite tack: it is up to us to account for Charlotte’s title in terms of the entire work. There are some promising approaches to do just this, for example in investigation of instances where she juxtaposes a view of the entire stage of an opera with a close-up, as if seen through opera glasses. 1) When a set of letters offers ambiguity, the writer will usually exaggerate a decisive element to remove that ambiguity. In the present case that would be the foot of the purported “L” so as not to confuse it with an “H”. Why is it not extended but abbreviated instead? I think it is because it is not the foot of an “L” but a serif on an “H”, which leads me to the next point. 2) One also tends to add a part of the mistaken element to the corrected one so as to make any “oddness” look intentional. In this case, the abbreviated stroke at the foot of the mistakenly written “E” is added to the “H”. Nowhere in the other letters of the title are there such serifs. To my mind, the reason is because these serifs are only there to rehabilitate the mistakenly written “E”. 2a) An “E” was formed because the “H” had been forgotten and then remembered at the point where Ms Salomon was finishing the “E” and moving on to the next one. That explains to me why the bottom foot of what you call an “E” is much shorter—short enough to become a serif when the “H” is recovered. 3) I direct attention to the fact that all the other letters have their necessary elements in full length. There was no reason to abbreviate the foot of the “L” if that is what it was, because the following “E” was not yet written. Everywhere else all of the letters have room to go their whole length. Why not the “L”’s foot? Because it is not an “L” but a serifed “H” (for the reason stated in 2). 4) When measured with its far more extended middle stroke, the abbreviated nature of the bottom foot of the “E” after the “T” doesn’t make sense. Why would that “E”’s middle stroke be extended beyond both its top stroke and its far shorter bottom stroke, so much so as to touch the next letter (be it an “H” or an “L”)? If you take this “E” in isolation it looks completely out of proportion and visually topples over. The extended middle stroke makes sense only when seen as the middle bar of an “H”. (The corrective nature of that overlaid middle stroke is also evident to me in the wavy nature of its top as it touches the next vertical stroke to its right. When correcting a letter with a brush one doesn’t have the benefit of verve as when one just writes a letter and moves on. Instead, there is the quivering nature of trying to keep the brush still enough to make sure that the stroke goes where it is intended to go. 5) When looking at the image from the exhibition website, I see an underlying shorter middle stroke to the letter following the “T”. I think that over this middle stroke a full length stroke was added to cover it up and “erase” the mistakenly written “E”. 6) The overwhelmingly illustrative nature of the work raises the question: why is there no illustration of the opera glasses anywhere in sight? For an artist who is consistently specific in her forms and their context, this absence is inconsistent with an intention to write TELEATER — all the more since Ms Salomon could not expect that all who saw her drawings would know what a Teleater is. 7) The word “TELEATER” appears nowhere other than in the currently examined context. Ms Salomon starts to write “LEBEN? oder THEATER?”. She finishes the “oder” which is done twice to give it a coloured shadow. She goes to write THEATER but forgets the “H” and notices it only when she is finishing the bottom foot of the premature “E” and planning the next letter. Realizing her mistake she stops short on the bottom stroke of the “E” and saves the text by adding the right vertical of the missing “H”; she then extends a strong middle bar over the shorter middle bar of the “E”. She then adds a little serif to the right vertical of the “H” to match the mistaken “E”. Since it is in watercolour, short of starting over there is no way to get rid of the long top stroke of the “E”. 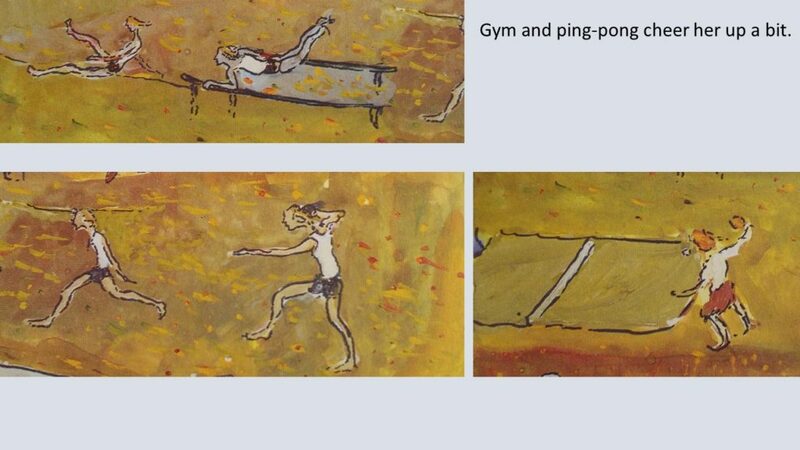 Given the playful nature of her work, I speculate that Ms Salomon just accepted this and took the fact in stride. In the absence of directly supporting elements (including repetition of the word, illustration of the object) I don’t see how one can say that it has been incontrovertibly proven that “TELEATER” is the intended word; one can only offer supporting evidence for one’s argument and let others add it to their own impressions. The profoundly sad outcome of Ms Salomon’s life deserves that we look at her work with gravitas, integrity and a sincere wish to maintain high standards of objectivity when attributing both meaning and intention to her words and images. 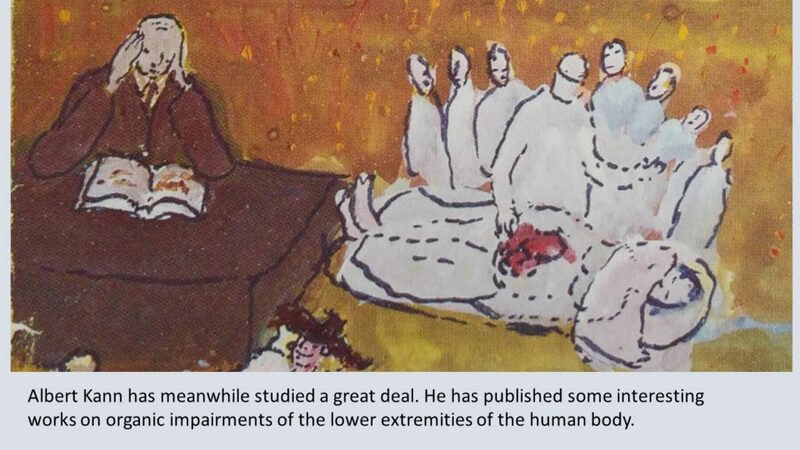 These observations would be in their place if we knew that Charlotte Salomon had made a mistake and we were called upon to explain it. But I still see no mistake in the writing of TELEATER, despite the longer and shorter lengths of parts of certain letters or the presence or absence of serifs. If in the title page of her work – the title page! – she had made a mistake, she could have turned the sheet over and used the other side, as she did on many other occasions. That she sometimes uses unexpected words or images for reasons that escape us is demonstrated on that very page, when she calls her creation a “”SINGESPIEL” rather than the standard German word “Singspiel.” I cannot explain why she did that and know of no one else’s suggestions for her choice, but it IS her choice and not a mistake. The same applies to TELEATER. 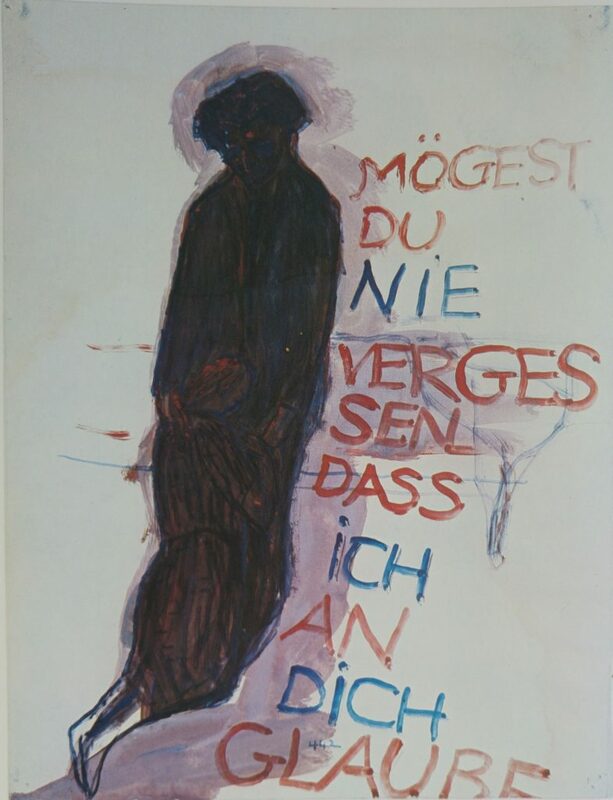 What you are saying, in esssence, is that neither you nor Charlotte Salomon can make a mistake. Yet look at how she wrote the word THEATER on image M004310, which I believe is the first mention of the word in the book. If in the body of the text there are other instances of the question “LEBEN ODER THEATER” clearly written as such and none of “LEBEN ODER TELEATER,” then that should really clinch it.